So I have become one of the THOSE WIVES. Not the kind of wife who shops and spends behind my husbands back or a wife who hovers over her children…. but the one who buys furniture that is toooo big for the room where it will reside. You would think that after being a furniture sales woman I would have remembered that nothing in a furniture store looks that big until you get it home. Yea, well it really did not look that big in the store! So this post actually started almost 6 months ago and is just now coming to an end. Early this spring my older brother contacted me to let me know that he was coming out to visit us in October. He planed to bringing some things of our mothers to me when he visited. The only draw back to this plan was I had no bed for him to sleep in and would need to get one before he arrived. So around March I began the second search in 4 years for a NEW headboard (the last bed crashed to the ground) and again didn’t finding anything I liked. I returned to the idea of finding something used and fixing it up. I did find something I liked at a used furniture store and everything went down hill from there. So I was happy… I got a wonderful new/used bed that was nicer then anything we had bought in the past. My brother would have a quest bed with the headboard Tom had made me.Little did I know I would not be this happy in a matter of a few days. So as you can see we did the only thing you can do when you do not shop with a tape measure.You steal the master bed room back from your seven-year old son.Then begin the long process of repainting and redoing the two rooms again( just painted when we moved in about a year ago).This time with the promise that I would not buy any more furniture for the next few years. The rooms are turning out very nice.The bed looks great and I am lucky to have a room big enough for it. Christopher is happy because we are doing a lot of kid friendly work to the room. We pulled up the old carpet and sanded,stained and sealed the floors so he can play more with this train collection. We are adding stars and a glow in the dark moon to the ceiling and a few puffing clouds to the walls. We should have Christopher moved back into his room in about a week and I can finally get a chance to set up my quest room. Lets just hope that it is all finished soon or my brother may not have a place to sleep. The moral to the story is do not let a wife shop for furniture with out a tape measure. It may save you lots of time and money in the long run. Hope all of you are having a great end of summer and I will be writing more as soon as this project is over as every extra time I have has been spent either sanding or painting the mistake I made away. 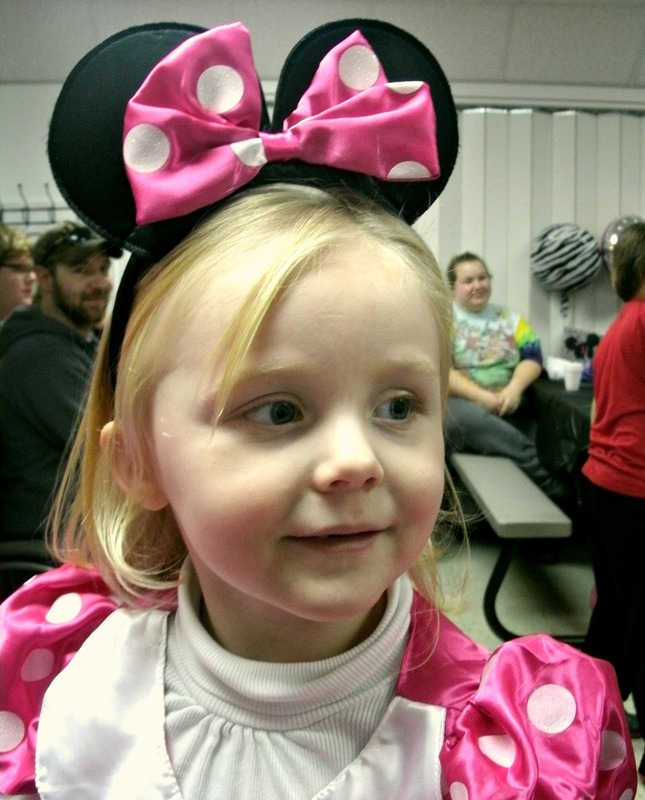 My sweet little grand-daughter turned 4 this month.If any of you have small children in your family you understand the problem with giving them gifts. It seems that small children attract people who love to buy gifts. As they grow older the pile of gifts slowly shrinks until at 19 or 20 you are lucky if your own parents remember your birthday. So as this young lady is so loved I had to really think over what we wanted to give her. I didn’t want to add to the pile of toys that she already had and some how I wanted to give her something that would last past her fickle little girl loves of Minnie Mouse and the movie Frozen. So after talking with her mother and my husband we came up with the idea of making her a toy box. We wanted to make one that hopefully would stay with her until she at least reached her preteen years. So while I was out-of-town Tom was able to get the supplies and assemble the box portion of the gift. 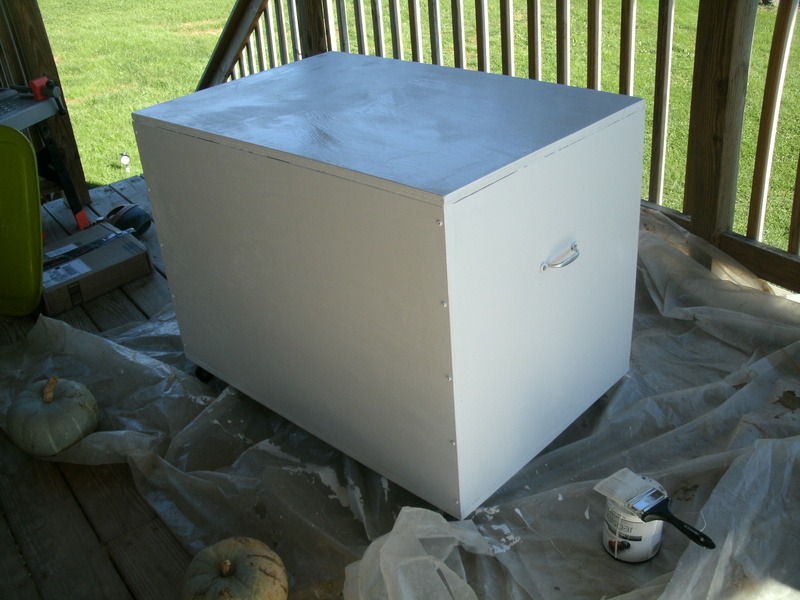 Then when I returned home I painted the box with several coats of white enamel paint. I talked with my son and his wife about what they wanted on the toy box. 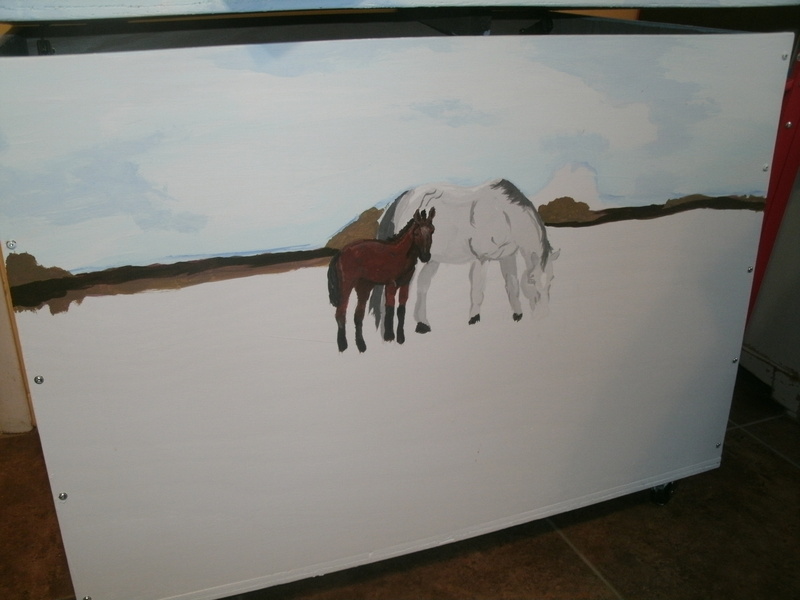 I could get stencils and put images of Disney Characters or even just put a decal on the box but I quickly realized that they thought that a painting of a horse would be something she would grown into and that it would be so nice for her room. Well that opened up a whole new idea for me. 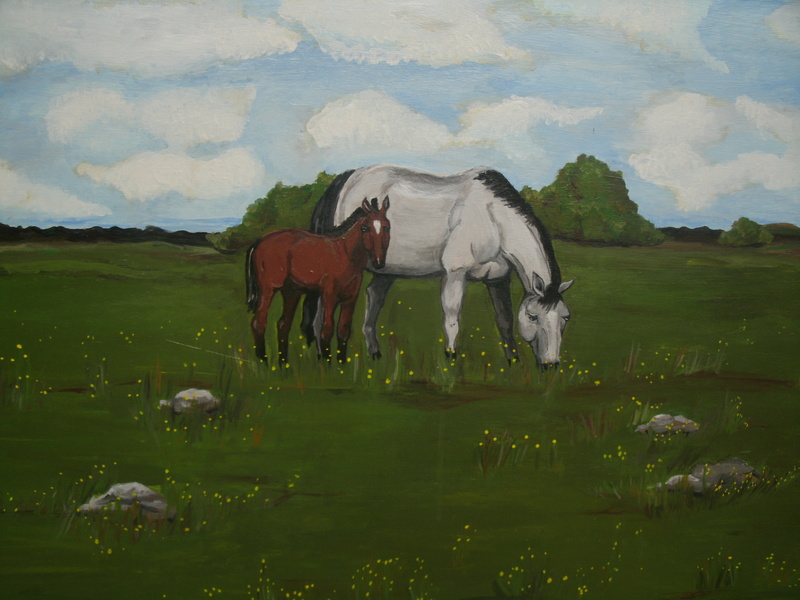 I do like to paint and have a back ground in art, but the one thing I have never painted or even tried to paint was horses. It is hard to believe but they are my greatest fear in all the subjects I could attempt. I spent years raising, grooming, feeding and caring for loads of horses. I have spent hours photographing them but never ever drawing or painting them. I have no idea why.. I just never thought I could do them justice. They are so amazing and powerful just thinking about it I get over whelmed. So how do you over come a fear that has lasted over 20 years? You have a 4-year-old tell you ” I want ponies MaMa” and you just jump in and hope to not drowned. So after a few days I found what I thought would look good. No ” My Little Pony” stuff on this box.I got approval from mom and dad and started the hours of covering the front of this toy box into a horse-box. The process took about 10 hours from sketching to final clear coat. Several times I thought I had a total mess on my hands as I progressed through the layers of paint. I would paint a while and let it dry and walk away for a few days and try another coat and another fix. Each time as I sat at my kitchen table with the huge box on top of it I would think. Horses? Why Horses? I have no experience at this and I am sure it will look like I have no idea what am doing. So the finale painting will pass as for a 4 years old toy box. I can still see my mistakes but, I am so glad that some how a 4-year-old was able to make me stretch my skills. She was able to make me face a fear I have had for years. I am so glad that we made this gift for her and that maybe she will keep it and some day share it with her little girl. It is truly a gift from my heart and made me so happy to see her love it ! Happy Birthday Paige you Ma Ma thinks the world of you!